Thanks to @pryszkie for recording the session ! A panel at the Voice of Block conference demonstrated many ways BIMStorm can assist the disruption and re-solution of any industry that uses buildings to conduct business in any way. Kimon Onuma, James Salmon, Patrick Kijek and Mike Bordenaro presented with Chicago Blockchain founder “Disruption” Joe Hernandez in a concluding panel at the inaugural Voice of Blockchain conference on Chicago’s Navy Pier, August 24 – 25, 2018. The conference the leading event that focuses on bringing the transformative Blockchain technology beyond the cryptocurrency market. This secure, distributed ledger system was shown as beneficial to all markets where trusted, transparent, immutable records and agreements can accelerate direct relationships between law-abiding individuals and entities. 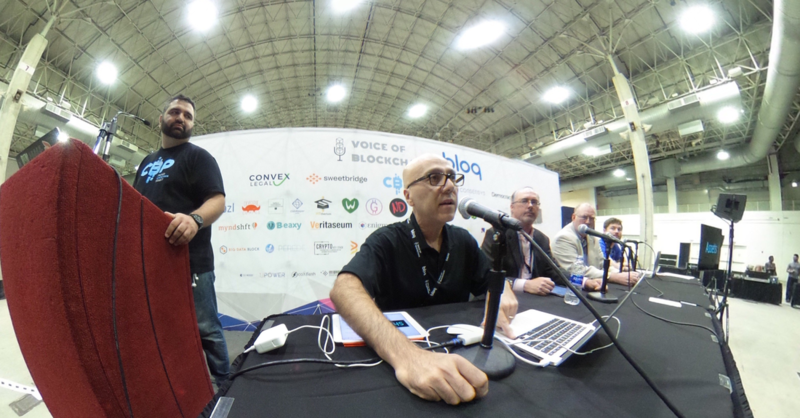 Hernandez used the panel to demonstrate the 1) Governance 2) Asset Visualization 3) Legal foundation and 4) Valid Blockchain business processes that will be used to sell tickets and booths at the 2019 Voice of Blockchain. By using Blockchain processes for all participants in the next Voice of Blockchain conference, there will be a self-fulfilling prophesy of increasing use of this new distributed ledger system that accelerates trust and improves data security. BIMStorm followers are familiar with the opens standards-approach to visualization of buildings and equipment to improve secure information sharing in real time. Typical use of Building Information Models does not use real time interaction through web services. Onuma took the BIMStorm process further by linking the visuals to online smart contracts established by Salmon. Onuma then linked those two items to a Blockchain payment method as a transparent, immutable record of what was agreed. Kijek validated the Blockchain programming elements of the process and introduced the use of Blockusignas a useful web tool agreements. Bordenaro explained the ISO 55000 asset management system as the governing document being used to guide business processes. It was shown how a single ticket will be sold at the next event at Navy Pier. It was also shown how a conference booth will be sold at the next event at Navy Pier. Then Onuma zoomed out from Navy Pier and showed a high rise building being built at a nearby site. He stripped back the virtual roof, showed a condo inside and had a live feed of the price linked to the rate of Bitcoin cryptocurrency. The theoretical price of the virtual condo increased from about $750,000 when Onuma first made the link a week previously to about $783,000 when he opened the link live at the presentation. This marks the first time the live price of a cryptocurrency was tied to a live Building Information Model. The presentation showed how Blockchain can dramatically disrupt and re-solve building industry waste and inefficiency. Another first was the presence of a Blockchain for Social good section at the “Voice of Blockchain” conference. While other Blockchain conferences focus on the cryptocurrency application of the technology, this event sought to bring benefits to all industries, including non-profits. BIMStorm is proud to have been part of such a significant and socially conscious event where BIMStorm processes were shown to continue being at the forefront of enabling dramatic improvements for all markets and all people.